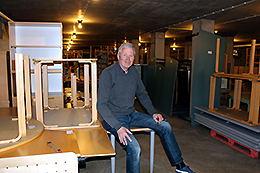 Återbruket is the LiU service that offers furniture and other items for reuse free of charge within the university. It has only been in operation since April this year, but has already found new homes for more than 1,100 items. And a great opportunity for anyone looking for a real bargain is coming soon, when the Origo Building is emptied of all it contains. In March 2017 everyone who is currently working in the Origo Building will move into the newly refurbished D Building. All the furniture and fittings for the around 200 workplaces in the Origo Building, together with all of the public spaces and kitchen facilities, will then become available for reuse. Shelving, drawer units, desks, chairs, sofas, tables, lamps…. “There’s going to be a lot of extra furniture, and we have already received some requests from departments looking for items,” says Micke Nilsson, manager of Återbruket. E-mail aterbruket@liu.se or visit Återbruket’s page in Lisam, liu.se/aterbruket. Reused furniture is free of charge. Transport and, where relevant, assembly or installation is charged at SEK 375 per hour. Återbruket, which started as a project with support from the LiU fund for carbon offsetting, has got off to a flying start. At the turn of the year, Micke Nilsson started to construct a “goods on offer” site, similar to eBay, and it went live on 24 April. Between then and 3 October, Återbruket carried out 96 commissions and found new owners for 1,100 items. These are items that previously would have ended up forgotten in a store somewhere, or simply discarded, while new furniture was being purchased elsewhere in the organisation. In this way, furniture and fittings are taken care of, repaired or cleaned if necessary, and passed on to new owners, saving LiU the money that otherwise would have been spent purchasing new items. Benefiting not only the university’s economy but also the environment. One example is LiU Holding, which received 150 products to fit out premises in Motala for courses for newly arrived academics. Återbruket was able to deliver, and Micke Nilsson estimates that the cost of purchasing new furniture would have been SEK 270,000. Another example is the Degree Administration Office, which was able to fully furnish a room with reused furniture from the library, saving around SEK 72,000. It’s difficult to calculate the overall gain, since it’s necessary to estimate what new products would have cost in each case. “But I’m sure that we are at least breaking even,” claims Micke Nilsson, who is happy to visit and provide more information about Återbruket. Micke has met purchasers from throughout the university, and it currently giving the cleaning service staff a review of Återbruket’s activities. He plans to continue to visit all departments. “Återbruket should always be the first port of call, before purchasing anything new,” is Micke’s simple and obvious vision.